GRSM has completed the implementation of three new facets of the Park’s Climate Friendly Parks program, with funding from a joint U.S. Departments of Interior (DOI) and Energy (DOE) initiative called the “Clean Cities National Park Initiative.” And in this case the new equipment does not just help the Park leave a smaller footprint – it allows the public to join in the effort. 1. Five gasoline mowers were converted to run on propane autogas – These mowers operate near visitors on a regular basis as they mow diverse areas from along roadways to fields in Cades Cove. Additionally, the new mowers performed so well over the summer that the Park has already purchased two additional propane mowers. All of these mowers now run exclusively on propane. 2. Three new low-speed electric vehicles for localized use – These vehicles replaced larger gasoline vehicles and emit no pollution at the tailpipe in the Park. The vehicles are mostly providing service in campground areas like Smokemont and Elkmont, as well as in Cades Cove. These vehicles’ fuel economy goes from around 20 MPG to over 100 MPGe (equivalent). 3. 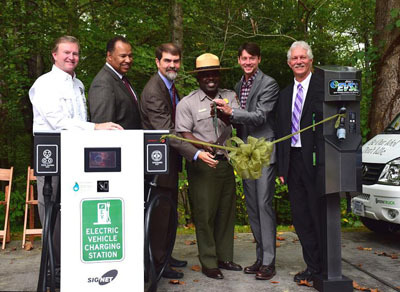 Two kinds of electric vehicle (EV) recharging equipment were installed on both sides of the Smokies – Both 220V “Level 2” charging and 208V “DC Fast Charging” (DCFC) equipment have been added at Sugarlands and Oconaluftee Visitor Centers to allow visitors with EVs to enjoy more mobility within the Park while creating zero tailpipe emissions. Future Park EVs will also be able to utilize this equipment for their own recharging needs. ETCleanFuels Director Jonathan Overly noted, “We really enjoy doing anything we can to help the Smokies. We are even more proud of this partnership now that we have enabled Smokies’ visitors to get in the game by using the EV charging equipment, or even reducing their idling time.” Overly is referring to the addition of some signage in certain parking areas requesting that visitors not idle their personal vehicles unless necessary. 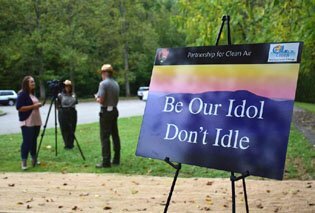 Captions: ABOVE – Great Smoky Mountains Association, Nissan and DOE and Clean Cities partners join Superintendant Cash for the ribbon cutting; the new DCFC (l) and Level 2 (r) equipment are in photo. 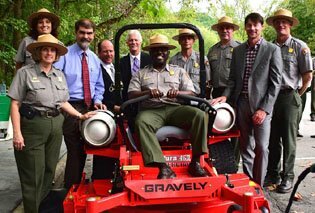 BELOW – The new idle reduction signs in the Park; Park staff and others join Cash with one of the new propane mowers; Park staff and others help show off the new low-speed EVs in use in the Park.